I received my editorial letter recently and have been planning my revisions. Since today was the last full day of classes, my mind is shifting from teacher mode to full-time writing mode. The new scenes are playing out in my head, and I’m itching to get them on paper. One thing that will change is the title. The working title has been RESURRECTING EMILY. The reasons? you ask. 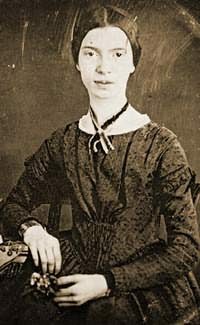 Well, I have a thing for Emily Dickinson (I love her), and she has a strong influence throughout the story. In some ways, I want to help “bring her back” to the forefront with young readers (most of my students know nothing about her). Also, the two main characters are named Emily, although one always goes by her middle name, Elizabeth. One of the Emilys attempts suicide. Which one? you ask. Well, you’ll have to buy the book to find out. The title, however, has an obvious religious reference and my novel is not about traditional faith. So, I need a new title, preferably a first line or other phrase from a Dickinson poem since her work is featured in the book. I have some possibilities, and I would love for you to chime in and vote. I’d like to send my editor the best ones. Me: How about A CLEAVING IN THE MIND? Sister: Cleaving sounds like cleavage and it’s on teens’ minds. No. Me: How about A PAIN SO UTTER? Sister: It makes me think of cows. No. Me: How about A FUNERAL IN MY BRAIN. Brother: Geez, what kind of book are you writing? Me: You’d know if you bothered to read an early draft. Brother: I thought it was about high school. Me: It is, but it’s not a romantic comedy. It’s about more serious issues in high school–teen depression and attempted suicide. Brother: I missed that part in high school. Sister: They covered that in health class when you were skipping. Mom: How about WHEN PAIN HURTS? Me: It’s not from a Dickinson poem. And, when doesn’t pain hurt? Brother: Well, I guess if you’re into that kind of thing. We all look at my sister-in-law. Sister-in-law: Don’t look at me. Brother: Call it FIFTY SHADES OF HIGH SCHOOL! Me: Why do I bother? Dad: Come on, guys, when you write a book, it’s like your baby. You put a piece of yourself out there. This is serious. Everyone is laughing too hard to hear him. Anywho…..please help me. Here are the ones that survived the family get-together. Trust me–they all “fit” the story. Comment here, on my Facebook Page, or on Twitter. If you could rank them in the order you like them (first being the best), that would be awesome!! Thanks in advance for your thoughts!! Have to say, the original is by far my favorite. Wish you didn’t have to change it at all. Not crazy about the last 2 titles because “Death” is such a strong & tragic word to a teenager (just my opinion). Don’t like Noteless at all. Again, just my opinion. Thanks! This is all very helpful. I love to hear different opinions. I can only mull it over myself so much! I like Resurrecting Emily! I don’t get a religious connotation from the title, and some might lable me as very religious. Hmmmm I’m having trouble letting go of Resurrecting Emily too. Emily’s Revival? Emily Again? Emily Once More? Finding Emily? Thanks for the suggestions, Kim. I’ll add them to my list. And, yes, I have read EMILY’s DRESS! I really liked it!